Powdered green tea (matcha) was already being drunk at the beginning of the Kamakura period, but preparing it in front of guests according to a fixed procedure, in other words entertaining guests through temae (tea procedure) began when chanoyu came into being. 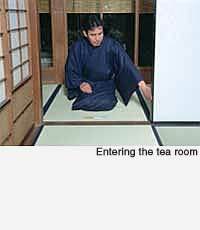 Arranging utensils for chanoyu, doing tea procedure and serving the tea to guests requires that the host, of course, and the guests also, follow the rules of tea procedure. When a clear etiquette of procedure is established between the host and guests through constant repetition, kata (forms) appear for each kind of action. For example, before drinking a bowl of tea, after the guests have bowed to each other, they bow politely to the host, to show the gratitude that they are feeling towards him. This deep feeling exchanged between host and guests, produced a fixed form of action (kata) as a component of etiquette. Then the kata became the expression of the spirit of host and guests, and by correctly performing the kata the host and guests were able to express their feelings toward each other. The exchanges between the host and guests in the tea room, through the connections and repetitions of these kata, became a verification of the feelings contained within them.